One of my bazillion knitting projects. Lately I’ve had everything going on, and nothing going on. I pledged to take a break from my personal Facebook page until the holidays were over, thinking that it would mean I’d have more time on my hands. I did have more time. Until I didn’t. I got addicted to the Song of Ice and Fire books (the ones that HBO’s Game of Thrones is based on). 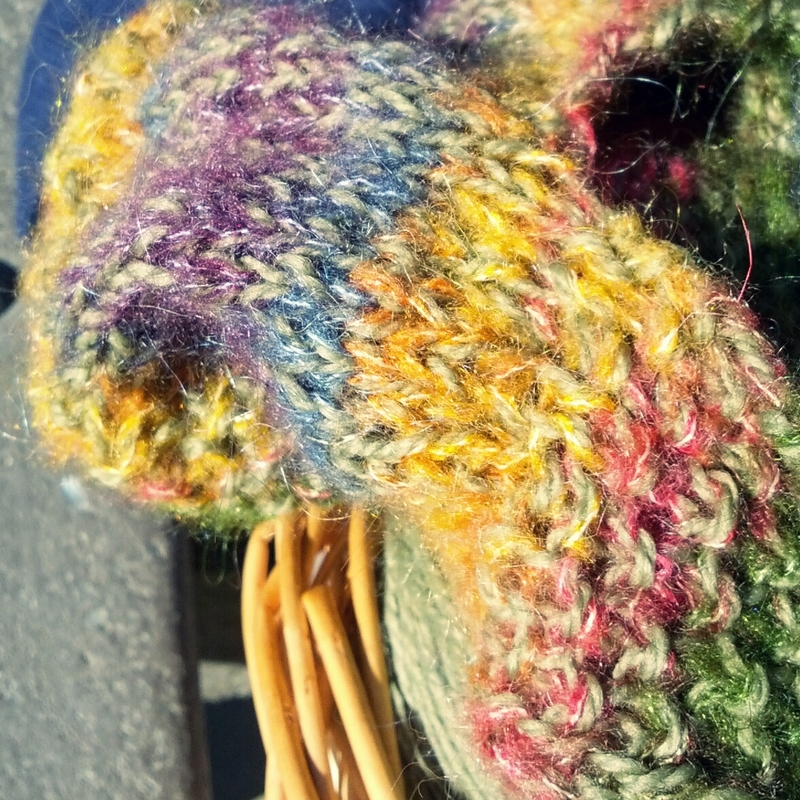 I started a bazillion holiday knitting projects. I’ve done more day trips with the kids. I’ve tried to cook more. Sleep more. It is all good stuff, I don’t have much extra time, that’s all. My visions of clearing my inbox, organizing the basement, and hatching some advocacy projects just haven’t happened. I’ve felt a little guilty about it, truth be told. I’ve wondered if I’m not “doing enough”. LP and I have had a stomach bug the past couple days. I had the pleasure of laying on the couch draped in a towel while LP alternately puked and slept on me. The girls watched endless hours of cartoons on the computer while eating peanut butter and honey sandwiches. When they weren’t doing that, they were tearing the house apart. Nightmare for me and LP. Heaven for the girls. I kept thinking about all the things I have failed to do over the past few weeks. I’ve had the same to-do list written up on our message board for months. I never did holiday cards this year. I noticed all the dirt and dust on the hardwood floors. We haven’t written thank-you notes for LP’s birthday and it has been a month already. I thought, here we are, Doing Nothing. In addition to my longer term guilt-inducing things I’d failed to do, I thought about all the things I’d planned on doing only this week. Ferry boat ride, back to the San Francisco Exploratorium, playdough, craft time at the library, more winter decorating. Instead I had a towel covered in vomit, a queasy stomach, messy house, and peanut butter smears on the floor. As a stay-at-home mother who has decided to homeschool, I feel a lot of pressure to do Things every day. You know, to let the kids reach their full potential in life (y’all know I dislike this term but use it here because it is so ubiquitous in parenting-speak), stretch their little growing minds. Despite that LP is the baby, I feel this most keenly for him because of his Down syndrome. Pressure to do more therapy, more supplements, more intervention. Honestly, I’m feeling more and more that all this pressure is a bunch of rubbish. Look, I figure raising kids is sort of like making bread. If you’ve ever made bread, you know that dough doesn’t stretch unless you let it rest. You have to knead the dough to develop the protein that makes it strong and gives bread its structure. Bake that ball of just-kneaded bread though, and all you get is a dry, hard, hockey puck. Go away, I’m quite busy being sick. So on the outside, it looks like we are Doing Nothing. The bread dough sits on the counter, no one tending it. My girls run around the house with no structure for a couple days and LP is sick rather than crawling around and exploring. Look at it a different way, however, and all that nothing is looks like something after all. The girls had some sweet sister time and rediscovered toys that had been long neglected. They both got a little bit better at having quiet down time, which is an important skill for kids to have if they can do it. LP learned a few new variations on peek-a-boo, worked on his adaptive immune system, and discovered jello. Dragging the kids around to every play date, every class, and every possible therapy appointment might be a lot like making hockey puck bread. There’s so much activity, but no time to relax and let it all unfold. In the meantime, we all run ourselves ragged and wonder why we are so stressed out. It’s like waking and sleeping. Neglect one and the other suffers; we all need balance. Not that I’d choose getting the stomach flu again, but it’s been a good reminder in a hectic holiday season. There’s a lot of something to be said for doing nothing. I love your bread analogy! I bake challah every week, and it requires 3 separate waiting phases: waiting for the yeast mixture to puff up (10-30 minutes), then waiting for the ball of dough to rise (3-5 hours), then waiting for the braided loaf to rise again (30-60 minutes). Kind of like we need different kinds of “down-time” at different points. Coffee break? Day off? Vacation? This is actually one of the best things about homeschooling — if you need to interrupt it with a sickday/restday/whatever, there is no schedule that you have to shoehorn yourself into — you’ll just make it up another day. Anyway, if you are crafting/cooking/sleeping/spending time with kids more, then you are absolutely golden! You have it right, and so early in your journey. I learned I had to take time to be “normal” not only for my child with Down syndrome, but for myself and my family. 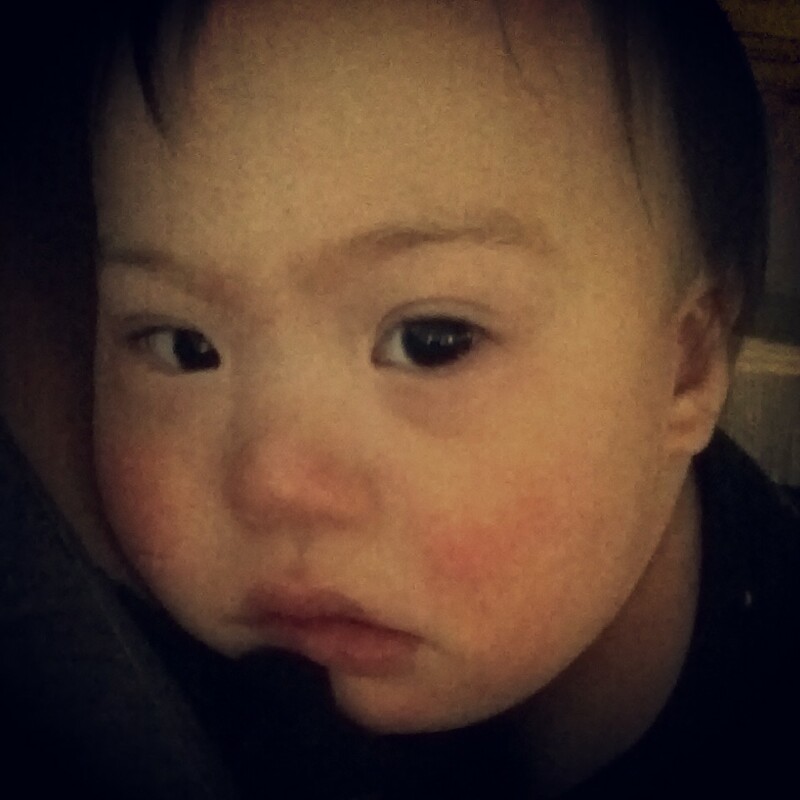 There were days, weeks, even months when I stepped off the “mother of a child with Down syndrome” wagon and just let it be. These were times of healing for myself and my family. They provided the normalcy and time we all needed……including Max (my son) who for once wasn’t being encouraged/required to try harder, do it again, “not that way, this way,” “We will try again tomorrow.” He got a chance to just be himself, one of many instead of the focused-upon one. He got a chance to be okay just as he was. Our kids spend a lot of time hearing, intentionally or not, that they are not good enough. These family breaks let siblings get some of the time you frequently direct towards the one who “needs it more.” Bravo for learning this early. Great insight. What a fantastic discovery you’ve made and revealed. I didn’t discover that magic until THIS year. II’m 46 years old with one kiddo in and one kiddo outside of the home and am just now practicing what I should have been preaching 20 years ago. Thank you for such a timely and relevant post. I hoped it reached some younger mamas like yourself :-) Even at my age, I discovered that it wasn’t too late! First of all, I am so sorry you guys have stomach bug. Feel better first! After I broke my foot a month ago, I had a strep throat. My house looked like just the way you described. Then, my husband got sick and we have been passing the sickness around to each member of family. No bueno. Last night, I realized that Christmas is next week and I haven’t done any shopping for the family members or written cards. I didn’t even take photos of my kids for the Christmas cards. This is MWAC fail! So my hubby and I teamed up and amazon primed everything. I am barely surviving day by day feeling like I am letting down everybody. The worst part was the all the therapists brought something for Ella (saying Merry Christmas) and I had no clue this was the last session before New Year. That picture of LP just breaks my heart. I hope you both are feeling better! You are doing plenty my friend. Even if you are doing nothing, that’s perfectly fine. Sometimes doing nothing is what you need. It sounds like you have accomplished quite a bit since your Facebook hiatus and you have spent quality time with the kiddos! So sorry that you and LP were ill. Poor wee lamb! Hope you are fully recovered now. Your girls will be quite all right being feral for a few days. It’ll improve their hunting/gathering skills. Love your wisdom, as usual. Hope you and LP are feeling better. 12.27.13 I actually looked you up right now because I missed you and wanted to see if this holiday hiatus from Facebook should be something permanent that I should copy. in some ways, yes, but i do love reading a few good articles that pop up on my Newsfeed, stuff i would never come across otherwise. the way you communicate is so easy for me to understand! homeschool ME! i was thinking so much about this whole striving business and how i almost feel relieved when i am legit sick (though more of mohm-sahl variety, NEVER want the stomach eeshews, blech!). now that you mention it, something rubs me the wrong way about that phrase too – reaching full potential. btw, this is my fave picture of LP. bite him for me.